We have a Facebook group for our Nourishing Ourselves community called Nourished. Sean Cruz offered to serve as our volunteer moderator for the month of December and he shared a snipet of what follows as he nursed a sore throat. He wrote, “This sore throat has really gotten me by surprise. I went through the medicine cabinet looking for my netty pot and decided to clean things out. I was reminded about how sick I used to be. 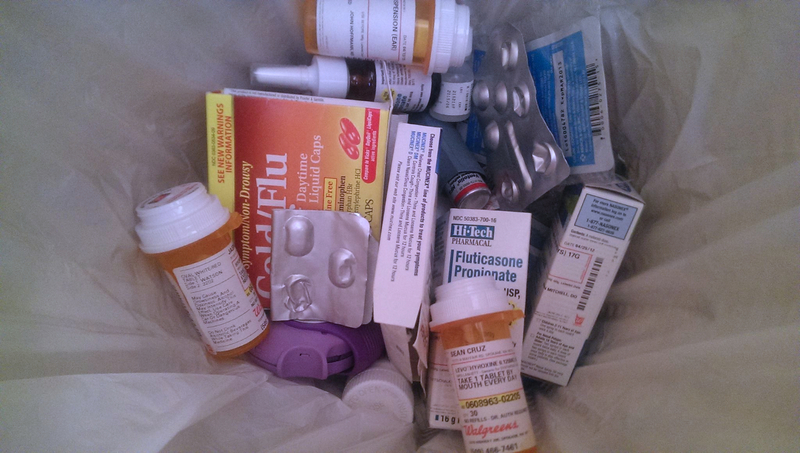 I threw out every medicine I had because it was expired! I had asthma, dermatitis, thyroiditis, allergies, acid re-flux and constant colds, flu’s and coughs. Thank you Sandrine, your video was one of the many things I found that helped me get my life back.” Later he added: “Here are all my expired medicines in the garbage. The biggie is the thyroid hormone I used to need. I took it for 17 years when I was diagnosed with Hashi at the ripe old age of 23, at the tail end of a four year stint as a vegetarian.” I asked him to expand what he shared so I could publish his testimonial as inspiration for others! Please note that some health practitioners think it is actually valuable to have immune challenges so that the body can flex it’s muscles. It isn’t necessarily a sign of overall poor health if we experience occasional cold or flu symptoms. My own goal is to fortify my immune system in every way possible. Sean serves as one of the Weston A. Price Foundation chatper leaders in Spokane, Washington. I made this bold and impossible statement as a very serious challenge for me to solve the numerous medical issues I was experiencing. I had already experienced limited success in the prior two years through dietary changes felt like I was heading in the right direction. Further, my personal studies on plant diseases (I am an overly ambitious gardener) had already lead me to conclude that my ideas about the root cause of disease were inadequate, and was probably also wrong for animals. This resolution brought me two new assumptions: first, that all organisms require sufficient nutrition to thrive, and second, that health is not an accident. If I caught another serious cold as I did every year without fail, it wasn’t simply due to exposure to some terrible mysterious virus, bad genes or just dumb luck, but rather that my own body was providing nutritional support for a disease organism to thrive. My very own cells were weak, deficient, malformed and otherwise broke down too easily and thus became food for germs to consume and multiply. My immune system must then also be weak and deficient, unable to combat the intruders who found paradise in my coughing lungs. The year started off with symptoms of pre-diabetes, acid reflux, thyroid disease, asthma, allergies, dermatitis, and constant flu’s, colds and coughs. The year ended with none of those conditions, and miraculously I was even able to drop a 17 year long prescription to thyroid medication. What I did was twofold: remove all inflammatory and toxic substances from my environment and add all the most nutrient dense foods I could identify. So I threw out the microwave and eliminated all processed foods from my diet. Next I made a massive reduction in in total carbohydrates consumption (sugar, bread, grains, beans, rice, corn, potatoes). I then identified and refused all other inflammatory foods including grains, breads, vegetable oils, milk, legumes, nuts, cheese, etc. I also cut out most fruits, especially bananas but also apples and pears. What I added were the most nutrient dense, naturally flavorful and rich foods I could find. I sourced pastured animal products and doubled the amounts of beef, chicken and wild caught fish I ate. I included organ meats in my diet for the first time and consumed copious amounts of bone broth, making a large pot of soup every week. My fat intake went up 300%. I ate half a stick of butter a day and consumed everything with animal fat: lard, tallow, goose fat and duck fat. I avoided white meats and looked for only the oily and greasy cuts. I also needed to learn to cook and eat properly, to taste things cleanly without overpowering spices and sauces, and to learn how food made me feel for days afterwards. I discovered over-cooked eggs were inflammatory and caused me heart burn, but under-cooked eggs with loads of butter digested easily and left me feeling happy and content. I learned to save and use leftover bones, to eat the marrow and simmer slowly for a rich broth. I discovered organ meats, made rich pate’s and learned to cook meats carefully and always rare. I found that well aged hard cheese with butter was nourishing, but soft cheeses caused inflammation. I learned how to identify and taste for quality in milk, butter, meat, fruits and vegetables. It’s been two solid years illness free, but at the tail end of December 2015 a sore throat developed. From October to December I wasn’t eating poorly, but I also wasn’t eating well and had just let too much slip. I recovered quickly by Christmas. Feeling newly reinvigorated I dove into the medicine cabinet and found old and expired medicines and threw them out. 2016 resolution: never ever get sick again. Have you ever made a New Year’s resolution that had a transformative impact in your life?